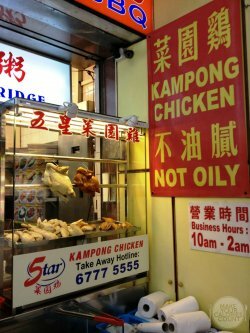 Five Star prides itself for serving kampung chicken, now you may ask, what distinguishes that from the usual broiler chicken? Let our taste buds do the talking! The Chinese lady who took our orders was courteous and patiently went through the menu with us. We were asked which part and cut from the chicken we wanted and we went for the drumstick since it was the lady's favourite. For the record, there was an additional 50 cents surcharge over the normal cuts. If you looked close enough, there was minimal fat underneath the skin and that is when you know you are getting the real thing when Five Star boast about their serving of kampung chicken! In place of the fat, there was a beautiful thin layer of jelly which separated the succulent chicken flesh from the skin. 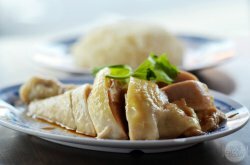 From my understanding and experience in trying to cook my own chicken rice at home, it required soaking the poached chicken in iced water, which was essential to lock in the juices. As expected, the flavour of the chicken was noticeably stauncher than the typical broiler counterparts. Partially owed to the selected cut, the flesh was really tender and in our opinion, cooked to perfection. It is always this fine line between getting it perfect and undercooked. Well, we are glad to say that on this occasion, it went the right way. Now if you think that was the end of it, you would be missing out on the beautiful self-concocted sauce luxuriously drenched over the chicken. The secret to this was that it was specially brewed in-house from soy sauce with added soy beans and rock sugar. Personally, I felt that the icing was the addition of rock sugar, which not only enhanced the aroma of the sauce but more importantly offered a good balance to the flavour. It stood in between a pleasant savouriness and a good unami oomph. Tipping the scale was an even diffusion of salinity complemented with a mildly sweet after taste. Shiok! 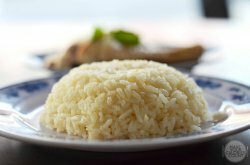 The accompanying rice to the separately plated chicken portion has to be good before we can conclude it to be a delectable dish. We particularly enjoyed the lovely texture to the rice where each grain was easily separated. It would suit the calories-conscious because the rice was not overly greasy. The trade-off was however the lack in a strong kick of flavours. The thing with kampung chicken is that the flavours are retained within the meat itself rather than superficially on the fats. The lady had a minor complaint that the rice was slightly on the dry side as she would have preferred a heavier touch in terms of flavour. On the other hand, it suited my palate perfectly for I found that it was oily enough to keep the grains individual yet not leaving a mess on my lips! The best part for me was to scoop up some of that beautiful sauce from the other plate and trust me, you know it is sensational when you inadvertently give a thumbs up. Readily available on each table was a silver tray containing the freshly prepared chilli sauce, ginger purée and dark soy sauce. Personally, my SOP in grading chicken rice always has 3 key components to match - first the chicken, then rice and lastly the chilli sauce. 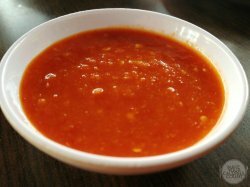 In my humble opinion, there is no short cut for a good chilli sauce other than fresh chilli padi for the heat with an acidic tang from limes. 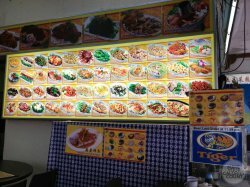 Many substandard chicken rice stalls take the easy way out by replacing the all important acidic twist with the acetic acid owed from vinegar. 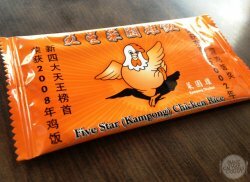 Well, you know what is a good chicken rice chilli sauce when you have tried one like this at Five Star. Honestly, I would do away with the ginger purée, but it looked good enough for a dab. 'Ooohh...not bad leh!' 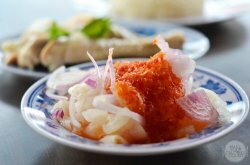 It was finely grated and richly packed in flavours. What we particularly favoured was that it was so fine that you do not have loose fibre ends clinging on to the gaps between teeth. While it packed a punch, I was contented enough to enjoy my chicken rice with just the chilli. As we were planning to eat along the way down East Coast Road, we stuck to one person portions. 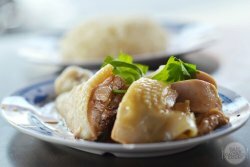 After scanning the menu, I was left undecided choosing a savoury dish from their list of Hainanese-styled dishes designed to give families a homely satisfying meal. I decided to go light and ordered a complementing appetizer to go along with the savoury main. You are probably looking at the pictures and saying 'Crap, that looks spicy!'. 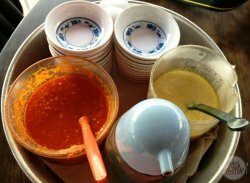 Surprisingly, it was carefully balanced with the right amount of sweetness to neutralize some of the heat from the finely diced chilli padi. 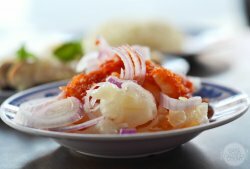 The chef took extra care in ensuring that the red onions were finely sliced, with the purpose of giving that added layer of crispness to the crunchy chicken feet. With an OCD for cleanliness, I scrutinized the skin of the chicken feet intently to ensure that there were no unwanted hair before putting it on the lady's plate. She is not exactly a huge fan of this dish but as the Chinese proverb goes '爱屋及乌' (loving something because your loved one likes it), so she learnt to acquire the taste under my influence! 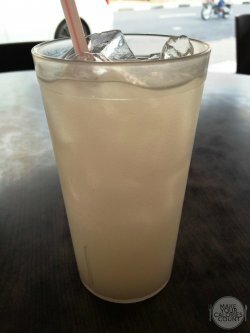 We casually ordered the homemade iced barley drink just to beat the afternoon heat. There was nothing too wow about it because you know what you are getting with this beverage anyway. I thought it was good gesture to have both serviettes being provided (free of charge) and sanitizing wet wipes. It was later when making payment did I realize that these individually packed wet wipes came at an additional 20 cents each and automatically added to the bill. The ambiance of the eatery was casual and relaxed though there was no air-conditioning at where we sat. 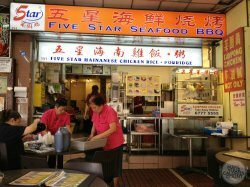 We noticed the adjacent shopfront carried the same brand name Five Star and had air-conditioning facilities but we were contented with a classic coffee shop dining experience done no-frills Singapore-style in our flip-flops. A worthy shout-out goes out to the PRC auntie serving us for her pleasant and attentive service. While this might return screaming remarks from readers who detest typical PRCs with a heated passion, there are still good breeds out there providing a humble service. A heads-up for those who drive, it would be worthwhile to park in one of those side roads or at nearby shopping malls such as 112 Katong and walk down because it is inconveniently located along the main road. In conclusion, it was a trip worthy of our calories and its position in the food guide books is certainly well-deserved!